Everyone knows Jackie Chan. 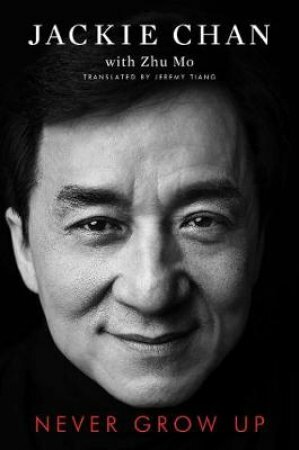 Whether it's from Rush Hour, Shanghai Noon, The Karate Kid, or Kung Fu Panda, Jackie is admired by generations of moviegoers for his acrobatic fighting style, comic timing, and mind-bending stunts. In 2016-after fifty-six years in the industry, over 200 films, and many broken bones-he received an honorary Academy Award for his lifetime achievement in film. But at 64 years-old, Jackie is just getting started. Jackie has never shied away from his mistakes. Since The Young Master in 1980, Jackie's films have ended with a bloopers reel in which he stumbles over his lines, misses his mark, or crashes to the ground in a stunt gone south. In Never Grow Up, Jackie applies the same spirit of openness to his life, proving time and time again why he's beloved the world over: he's honest, funny, kind, brave beyond reckoning and-after all this time-still young at heart.